Imodium is one of the UK's most well known diarrhoea treatment, and the original Imodium Capsules have provided a tried and trusted remedy for almost 40 years. The formula provides fast and effective relief from the symptoms of diarrhoea, while gently helping to restore your body's natural rhythm in just a single dose. IMODIUM is one of the UK's most well-known diarrhoea treatments. For nearly 40 years the original, easy-to-swallow capsules have provided fast and effective relief from diarrhoea and its symptoms while gently helping the body restore its natural rhythm in just a single dose. Imodium products contain the active ingredient, loperamide, which slows the digestive system to its normal pace. This allows the body to absorb fluids and salts as usual, restoring the consistency of stools. Certain antibiotics can be taken with Imodium to improve symptoms faster and are available from the Online Doctor service without a face to face consultation. Acute diarrhoea causes you to lose fluids and salt and can lead to dehydration. Imodium only treats diarrhoea symptoms and will not rehydrate you. For this reason, you should drink plenty of fluids while you have diarrhoea. This is particularly important for the elderly and children. For further rehydration, you may want to consider taking oral rehydration therapy, a soluble powder containing sugars and salts. Rehydration salts can be purchased from pharmacies. If you are on holiday, you have a high chance of getting diarrhoea if your body is not used to the water or the environment; these are uncomplicated cases that can be treated with over-the-counter medication. Diarrhoea that results from infection, however, should be treated by a medical professional. Initially, swallow two capsules followed, if necessary, by 1 capsule after every loose bowel movement. Take up to a maximum of eight capsules each day. Headache, dizziness, constipation, nausea, flatulence, abdominal pain, abdominal discomfort, dry mouth, vomiting, dyspepsia. Lactose, Maize Starch, Talc and Magnesium Stearate (E572). The capsule itself is made up of Titanium Dioxide (E171), Black Ferrous Oxide (E172), Yellow Ferric Oxide (E172), Indigo Carmine (E132), Erythrosine (E127) and Gelatin. Imodium capsules should be used only for symptomatic relief of diarrhoea and not as an alternative to rehydration therapy. Read the enclosed product information leaflet before taking this medication. Imodium should not be given to children under 12 years. Need to know more about Diarrhoea? Do I need a prescription for Imodium products? No. Imodium products are available over-the-counter in drug stores and supermarkets. Can my child take Imodium products? No. Children with diarrhoea dehydrate more quickly than adults, so it's a good idea to watch their condition closely and ensure proper hydration. You may give your child an oral rehydration solution, which you can find in soluble formats. Contact your doctor for proper dosage instruction. The rate of constipation associated with Imodium is low. Of participants in clinical studies, less than 3% reported constipation while taking Imodium products. Can I use Imodium if I suffer from IBS? If you have IBS, speak to your doctor or healthcare professional about using Imodium to treat your diarrhoea symptoms. 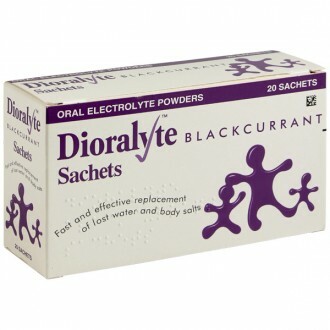 Will an oral rehydration solution treat my diarrhoea? Oral rehydration solutions replace lost fluids and electrolytes and help prevent dehydration. They do not, however, relieve the symptoms of diarrhoea. To help stop diarrhoea and prevent dehydration, you can use Imodium together with an oral rehydration solution. 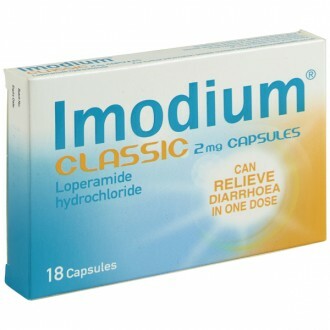 Imodium products contain loperamide, a medication used to stop diarrhoea. Continue reading for advice on its use, warnings and side effects.